We love our Members. Their incredible support allows us to make a difference to animals both locally and all over the world. This month, we’re spotlighting a family of Zoo Members that deserve recognition. We’re thrilled to introduce you to April’s Featured Members: the Avila family. We asked the Avilas to tell us a little about their favorite Zoo experiences and what being Zoo Members means to them. We are relatively new members to the Houston Zoo. We joined shortly after our son Oliver was born. We thought the zoo would be a nice outing for our son on warm “winter” days. Oliver was born on Groundhog’s Day 2018 and since his first birthday was a Saturday, we decided to skip the weekend crowd and celebrate with a special outing on Monday. 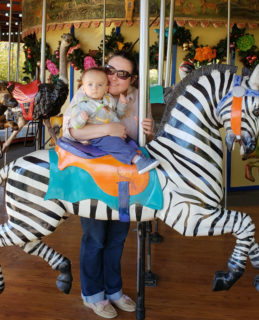 We come to the zoo almost weekly, but we have held off on a giraffe feeding even after countless carousel rides just feet away! It was tough since giraffes are his favorite animal, but we really wanted his first up close experience with one to be around his birthday. This experience was particularly special because it was on February 4th, the birthday of his maternal great grandmother. We were apprehensive. Of course, we considered the possibility that he would have no interest or would be frightened. But no, with confidence our little guy feed his 4 feedings (his, plus mom’s, dad’s and grammie’s) to the giraffes. It is a memory we will always have for his first birthday. In addition, we hope our continued trips to the zoo builds his appreciation and compassion for animals. We are lucky to live in a city with such a lovely habitat that offers up close experiences with wildlife. We particularly look forward to him attending zookeeper talks, learning about conservation, and having fun with the various playground and kid-centric events. We appreciate the zoo’s effort to bring nature to us! Although, we are not looking forward to when he wants his favorite bird a Victoria Crowned Pigeon for a pet. We think we can explain that a giraffe is too big for the backyard, but the pigeon will be a different battle. In addition, thanks to the staff and volunteers, you are awesome and your patience, knowledge, and helpfulness is appreciated!